Former Congress president Sonia Gandhi said truth & transparency had been tossed aside under the Narendra Modi govt, and institutions subverted as well. 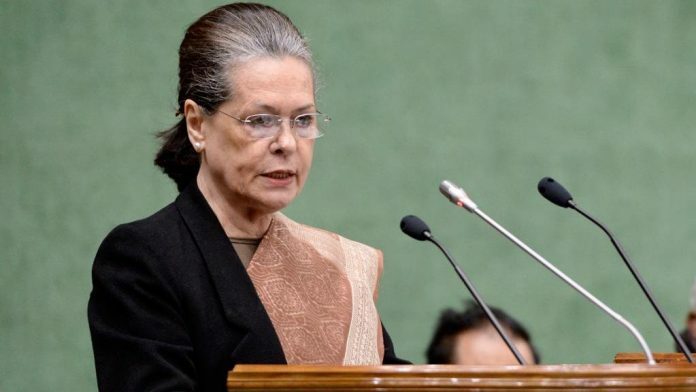 New Delhi: Former Congress president Sonia Gandhi lashed out at the Narendra Modi government Wednesday, saying “bluff, bluster and intimidation” had been its governance philosophy. Gandhi, the leader of the Congress Parliamentary Party (CPP), was addressing a meeting of party MPs. Saying the “mandate of 2014 has been betrayed”, she added that the “mandate itself was obtained by deceit and dishonesty, by misleading the people”. “It was inevitable that it would be found out and exposed sooner or later. That is exactly what has happened,” Gandhi said. She also weighed in on the success of the Congress in the recent assembly elections, where the party reclaimed three states of the Hindi heartland, and praised her son Rahul Gandhi for “taking the opposition head on”. She credited Rahul, the Congress president, with bringing in “fresh energy” into the organisation, for working “tirelessly”, and even reaching out to other political parties “who share our vision of India, who share our agenda for faster economic growth with full social justice”. “We go to the forthcoming Lok Sabha polls with renewed confidence and resolve,” Gandhi said. “Our victories in Rajasthan, Chhattisgarh and Madhya Pradesh have given us new hope. Our opponents were earlier projected as being invincible. The Congress president took them head on, mobilising and motivating lakhs of our workers who, with him, gave their all,” she added. “We won in what were believed to be their strongholds. That demonstrated our resilience.”. Gandhi termed the five years of the Narendra Modi government as “trying times”, but congratulated Congress MPs for doing the “best possible under the most difficult of circumstances” in both Houses. “I know it has not been easy because democratic space — which is ours by right —has been deliberately denied to us,” she added. Slamming the government for weakening Parliament and muzzling debate and discussions, she added that the institution of Standing Committees had “all but disappeared”. “The route of Money Bill, described by one Supreme Court judge as a ‘fraud on the Constitution’, has been resorted to ever so often to escape legitimate scrutiny in both Houses,” she said. She added that truth and transparency had been “brazenly tossed aside” under the Modi government, and institutions subverted as well. The past five years under the BJP, she added, were marked by “unprecedented economic stress and social strain for our country”. Gandhi said voters would see through the “jumlabaazi” of the Modi government, but urged members of the party to not get “complacent or take anything for granted”. “Our political adversaries have unlimited resources at their command. They will have no scruples and will stoop to anything to ensure that our forward march is halted,” she added.